June the 25th 1982. On this day in history two incredible science fiction films opened at the same time. Ridley Scott’s “Blade Runner” and John Carpenter’s “The Thing” Both films were ahead of their time in terms of visual design and creature effects and influenced the way movies looked for decades after. At the time of their release both pictures did quite poorly at the box office. “ET” had come out two weeks earlier and Spielberg’s masterpiece made the world turn all soft and cuddly in the way audiences viewed Science Fiction and aliens in particular. So these two dark and heavy films chased the good mood crowds away. 30 years later their popularity is without measure and both films stand out as classics. Reviewers and fans alike will say that both movies are the directors crowning achievements. I love both motion pictures immensely, but Carpenter’s version of “The Thing” stands as one of my all time favorite movies. My good buddy Rod Andrewson and I were there on opening night and I don’t really think either of us were prepared to experience what we were about to see. The coming attraction trailer’s we got for this one were very vague and showed nothing from the film. Being huge fans of Hawk’s original, the teaser only showed a block of ice with something moving inside of it followed by text saying, “coming this Summer”. On opening night however terror in movies took on a whole new meaning. Most of my popcorn wound up in the air and on the floor and Rods candy did just about the same. Great times to be sure and we both went out and took back as many friends, (or victims would be a more proper term) as we could for the rest of the summer! hard to believe that all happened 30 years ago……. Anyways!!!!!!! If your a regular reader here your very familiar with the name John Carpenter. Johns films and music have always been amongst my favorites, and with today being the 30th Anniversary of “The Thing” I couldn’t think of a better way to remember this film than to have a quick chat with the master himself. John has done a lot of interviews as well as a great commentary on “The Thing” and every time there is a new discussion more interesting behind the scenes information comes out. Working on a location film is a huge undertaking and what you see on film is really the smallest part of the adventure. Watching the movie on screen you can only imagine that making “The Thing” was an incredible challenge on multiple levels. Ask anyone who was a part of this film and they will tell you that the production was hard but the end results were all worth it. JE. Hi John, Thanks for taking some time today to talk about your film. I remember watching your first big hit “Halloween” in the 70’s, and in one of the background scenes we see Jamie Lee Curtis watching Howard Hawks “The Thing” on TV. It was obvious then that you were a fan and it was funny to see just a few years later you would be doing your own version. If I could ask how did this come to be. Did you approach Universal about doing the film or did they come to you??? JC. I was asked to do The Thing, I was a fan but I really didn’t want to remake this movie. It took a while but Universal finally convinced me to sign on. so I agreed and the adventure began. JE. I was so glad that you took it on. When the trailers started showing in the theaters I was thrilled to see your name as the director. A lot of your previous films credited you with conceiving the screenplay. For “The Thing” you were taking on an existing story and I was curious to how much Universal allowed you to contribute. JC. Bill Lancaster (the son of Burt Lancaster) and I wrote the story together. We based our version on the Original story “Who Goes there” by John Campbell. We stayed far away from Hawk’s film, and we really wanted to make our own story. JE. Well You certainly did!!! For your Production designer you brought on John L. Lloyd. John has had a fabulous Career working on decades of Classic Television, and more recently some rather extravagant movies. What a treat it must have been to work with him. JC. It was!! John was a blast to work with and he was so professional. He solved a lot of problems before they had a chance start. JE. That was a brilliant idea to Use the US compound after it was blown up for the Norwegian camp in the opening of the film. JC. Yes it worked out great. We shot all the Norwegian exteriors last using the burned out US outpost and saved a lot of money. John (John Lloyd) did a fantastic job utilizing the same location for both sets. JE. I became a big fan of Mike Ploog’s art because of “The Thing” He does some brilliant fantasy work and I love his style of story boarding. How was it having him as a part of your team? JC. Boarding the film was a very important factor especially because for the most part we were shooting the movie in order. Mike put together a book logging all of boards, as well as some illustrations of how a lot of the visual gags would work. Mike took on the task and really did a great job with it. JE. Up to this point you had composed and performed all of your own scores. I was expecting the same with “The Thing” and was surprised to see Ennio Morricone’s name on the poster. I never knew the story about this so I was assuming that the scope of the show was huge and you didn’t have time to do it yourself, so you hired Ennio. HAAAA! Is that even close to what really happened? JC. No not at all, Universal didn’t want me to score the film,,, They wanted something more for their movie. Ennio was available so we hired him and I couldn’t have asked for more. I was always big fan of his music. JE. Ennio’s score defiantly captured your style, were you a part of how the score would be composed? JC. Yes, We were able to work together on the score, and mutually came up with how it should sound. Very fun times. JE. As far as your cast went you had no leading ladies, is that how it was Campbell’s story? JC. yes the all male cast came from Campbell and the actors we chose were all great fun to work with. This was my third picture with Kurt Russell and my first with many of the others. JE. Will Brimley pulled off quite a performance and he seemed like a fun actor to work with. From watching his other films he seems the same both on and off the camera. JE. He is a good friend of my father in law and he says the same about you! JE. This is also your third film using Dean Cundey as your director of photography. You two have had a great working relationship and I was curious to how you two work. I’ve been on sets where the DP not only lights the shot but dictates where the camera positions will be. JC. I love working with Dean… No one can light a set like he does and what he did on “The Thing” was just great. As far as setting up the camera, I don’t let anyone set up my shots for me, Haaa. JE. Watching “The Thing ” in Arizona was quite a treat, the theaters were always packed with screaming fans, and the local critics had nothing but praise for the film. This didn’t seem to be the case around the rest of the country. The reviews were harsh to say the least and the box office attendance was not what Universal was hoping for… You put a lot of yourself into your work so all of this had to have hit pretty hard. JC. Yes it did… Critics are critics and they really didn’t like the film. “The Thing” was supposed to come out before “ET” but Universal changed the order of release so our movie came out a few weeks later. Audiences now wanted nice alien movies and I feel this really pulled the film down. What hurt me the most though was that the fans didn’t like it! They bashed it severely and I couldn’t understand why. This all really effected me. JE. I can’t even imagine how hard those times must have been. You really do put a lot into what you do and I can’t believe that it was attacked so… Looking back on the film at the time of it’s release. regardless of how it was received, you as a film director have to be very proud of what you and your team put together. JC. In perspective I am very proud of “The Thing”. It all came together and I was very happy with film. JE. It must be rewarding to see how popular the movie has become today. JC. I am, it took a long time for the audience to come around and it seems to have a cult following. JE. Well John Thank you so much for taking the time to reminisce about”The Thing” and I am so glad we had a chance to catch up a bit. Take care and talk to you again soon. In case you haven’t seen “The thing” yet here is a brief synopsis of the film and some images to wet your appetite. It’s the winter of 1982 and a huge Antarctic snow storm is about to hit. Scientists at small American research base are stunned when a Norwegian helicopter begins to circle their camp, chasing and firing at a dog. When the helicopter is destroyed and the two passengers are killed, the dog is let into the base and roams free while the American’s try to figure out what has just happened. The American crew discover that their is a Norwegian base not too far from their own. So a the doctor and the US Helicopter pilot travel to the Norwegian base to see if their are any survivors. On arrival, they find that the place has been totally destroyed from the inside out. The two discover and large block of ice in one of the rooms that at one time had something frozen in it. Further exploration finds a frozen mans body in one of the burned out rooms He had committed suicide with a strait razor. On departure they make one more grizzly find. It’s of the mangled remains of what was at one time a person. They bring back the remains for further study and what the team discovers from the autopsies and by watching the Norwegians tapes leaves them all feeling that they are in horrible danger. As the clues are beginning to add up; the dog transforms into a horrible into a creature that attacks the other dogs in the kennel as well as the scientific team.. Fire seems to be the best weapon and the charred remains open up a box of more questions with very little answers. A new tweam is assembled and off again they fly back to the Norwegian camp and on this trip they discover the remains of a giant flying saucer frozen in the ice as well as the spot where the block of ice was cut from. They come to a terrible conclusion that they are dealing with an alien life form that has the power to transform and take the appearance of any living creature that it comes in close contact with. And man is the warmest place to hide. Paranoia sets in as the crew doesn’t know who the thing could be hiding in. Havoc ensues and one by one the the crew is lost as the Thing tries to survive. As the team’s #’s dwindle they discover that the creature has been building a spaceship under the ice using parts from their tractors and helicopter. The decision is made that the whole camp has to go at any cost before the thing can escape, or freeze again only to awakened when the rescue team comes in spring. Lots of story twists bring this horrifying to an open ended final and you are left wanting more. Carpenter and his team really made one wicked tale with “The Thing” and Johns talent’s as a director shined oh so brightly !!!! His story took us on a two hour adventure, deep into a frozen world where fear, claustrophobia and paranoia are the emotional fuels that make this film so utterly horrifying. Happy 30th John and to your amazing movie as well. 100,000 years ago, a disable flying saucer enters the earth’s atmosphere. The title was shot the same way as it was in the 1951 version of the film. The Norwegians hunting the dog. The truth is revealed and the entire population of the world is threatened if this Thing makes back to civilization. The first of the human victoms. Fire is the only solution. Turns into a moment of unholy horror. Rob Bottin at his best. this was in the original script and later re-imagined but when it was in the story this piece is what houses the ghosts and the curse of Mars, once it is discovered by an alien invader,, in the movies case, Earth, the simple touch of the intruders hand would break the seal and release the curse which would one by one possess each and every inhabitant of the planet until every one is either killed or taken over. this was the early concept for the Shining Canyon mine!!!! in the end it wound up being just to big of an idea. What you see of the in the final film version, the mine is basically an excavation site. February the 8th, 1980, opening day, & I was a senior in high school. I was just driving in my first car, had a job and a pocket full of freedom to go to the movies just about anytime I could squeeze them in. I was pretty new to the rated “R” world of films, and the ones I saw were so vastly different from Star Wars, Bambie, and the Jungle Book which were what filled my movie time just prior to my first “R” rated film, “Alien”!!!! I really had to pick carefully and work up a lot of courage to go because the territory was uncharted and unrestricted to what amazing or terrifying things it could show me…the gritty reality of more mature movies was horrifyingly wonderful and really captured my attention and imagination. 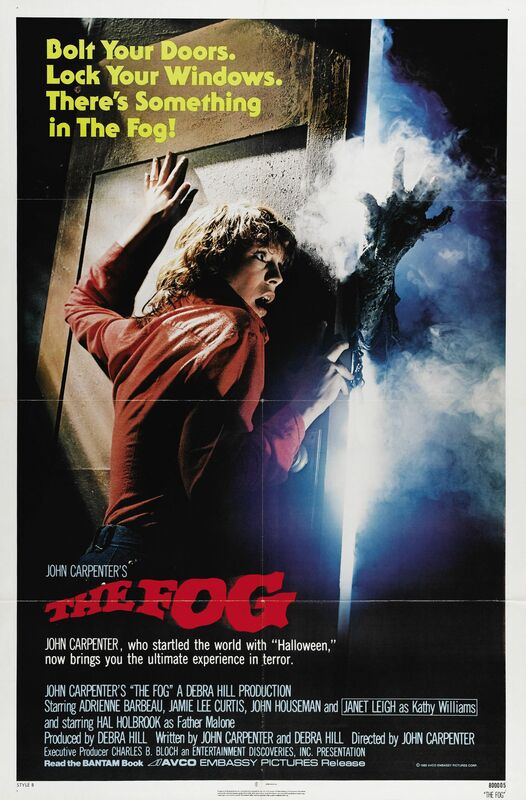 “The Fog” was my theatrical introduction to John Carpenter, and man was it a wicked little tale!!! I went alone to this one between school and work, and it thrilled and scared me for quite sometime after. From the film’s opening with the Ghost Story on the beach, to the revelation of the wicked story of how the town of Antonio Bay was founded, to all the horror that Mr. Carpenter so eloquently fashioned throughout this dark tale, I was drawn in. Thirty years later, I have seen this movie countless times and love it more every time I see it. “The Fog” is a great film to see John’s talent in the early days. He has a gift for storytelling, and I love that his talents are so broad, from writing, composing & performing, directing, editing and finally he’s especially gifted at scaring your socks off!!! John’s work with Debra Hill make for some awesome productions and are amongst my very favorites of both of their early career films!!! Lots of fun in-movie jokes in this one as well. John Carpenter plays a young church worker named Bennet in the opening moments of the show; Bill Taylor plays the bar tender. Bill Taylor, for those that don’t know, was the VFX supervisor on, and wrote the song “Benson, Arizona” from, Dark Star. He later went on to be one of the founders of Illusion Arts ( the optical and matte Painting facility) that just recently closed. Four of the characters in the film are named after friends and inspirations of John’s, Charles Cyphers plays “Dan OBannon” (Co Writer of Dark Star), George “Buck” Flower plays “Tommy Wallace” (One of the Coup De Villes and the film’s production designer), Tom Atkins plays “Nick Castle” (the third member of the Coup De Villes, and film buddy of JC), and finally Darwin Joston plays “Dr. Phibes” (a horror movie character played by Vincent Price). This one is a must see for Carpenter fans new and old. The film takes place in a coastal town and is told over about a 26 hour period of time on the 21st of April, 1980. The under story, as told through a diary read by Hal Holbrook, really sets the pace, combined with some excellent roles played by John Houseman, Janet Leigh & Jamie Lee Curtis (mother and daughter in real life), Adrienne Barbeau and, of course, Hal Holbrook. Rob Bottin is the creator of the special make up and also plays the lead dead settler, “Blake”. One awesome ride from start to finish, and the commentary on the DVD by John and Debra Hill really makes for a great movie both in front of and behind the scenes!! Enjoy, and Happy 30th to John Carpenter and one of his many masterpieces, “The Fog”! 11:55 and the ghost story begins!!! a favorite Carpenter trademark, The dead are not always REALLY dead! even if the killers hiding in the fog knock...don't answer the door! The fog not only hides the dead but it, too, is a living character capable of doing it's own bidding! this is an anniversary cover created for the 25th. The 30th editions are at the post office getting canceled, so keep an eye out for the new covers when I get them back. Today…February the 3rd, 2010, marks the 15th Anniversary of one of my many favorite John Carpenter films. 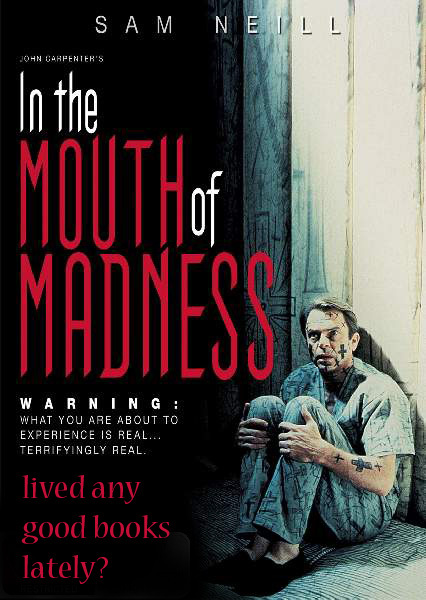 In The Mouth Of Madness is another team effort by John Carpenter, Sandy King, and writer Michael De Luca. The cast is a brilliant ensemble of characters played by Sam Neill, Charleton Heston, Julie Carmen, David Warner, and Jurgen Prochnow. The story is loosely based on the works of H.P. Lovecraft, and Mr. Carpenter again delivers a fine tale woven with his great talents and unique style. This one is a heavy dialogue piece, and it is a journey that takes a normal, well grounded in reality private investigator and follows him deep into the realm of insanity as the apocalyptic tale engulfs and makes him the main character in the story of the world’s end. Sam Neill plays John Trent who is an investigator/specialist at insurance fraud. He is hired by a publishing house to find their best selling horror novelist who has gone missing. Sutter Cain is the author’s name, and his books, if you read them, will somehow give you horrible nightmares that will soon possess you and make you a follower of Cain!!! Sam Neill is convinced this is a publicity hoax even though bizarre things start to happen around him after he leaves Charleton Heston’s office. Hell bent on proving this is all a hoax, Sam Neil buys all of Sutter Cain’s books and starts to read…yes the nightmares begin immediately, and Carpenter’s magic begins to drag you in and scare you but good. Neill’s character discovers that all the book covers have some unusual artwork and, with scissors, he cuts away revealing a puzzle that in turn represents a map that takes you to the fictional town from all of Cains stories called “Hobb’s End”. It takes a hellish nightmare to get you there, but once in Hobb’s End, you can not leave, and this is where the real horror and twists begin!! This is a very rich tale done with great skill and John’s very dark sense of humor. The score is a wild rock and roll piece written and performed by Carpenter and Jim Lange. Carpenter is always maturing as a story teller, and unique to this film is that he frames buildings and architecture through his camera in such a way that they, too, become characters in the story!!! Carpenter is definitely a master at what he does, and this one makes for another fun Saturday night flick to watch with a bunch of friends!! Below are some pics from the film, the trailer and a couple of links to fully immerse you into the Mouth of Madness, Enjoy and Happy Anniversary.